You may remember that I was given a $10 gift certificate to Lori Whitlock Designs store to one lucky commenter from that blog hop post. Well today I am going to announce the winner. Congratulations Andrea S. I don't have your email address so hopefully you will see that you won and will contact me at christineousley@mac.com and I will tell you how to get your gift certificate!! I will be back shortly with another post for Epiphany Crafts and Simple Stories and I have a feeling you won't want to miss it! This week we have an ANYTHING GOES theme and a BLOG HOP :-) There are 3 fabulous prizes from our lovely Heidi at Simon Says Stamp that 3 lucky entrants, drawn at random, will win !! You can see the piccy's of whats on offer on the Simon Says Stamp Challenge blog. 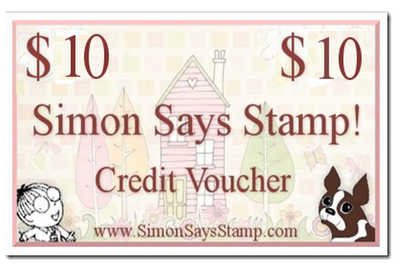 ALSO we have a $10 Voucher to spend in the Simon Says Stamp Store to give away at every blog along the way !! Here is my card for the hop. I chose to use a new Magnolia stamp called Tilda With Flower Pot. It's from the new Butterfly Dreams 2011 collection. I colored her with Copic Markers and designed the card with new Basic Grey paper. The paper is one of the new 6x6 pads, Hello Luscious, which I just adore for cards. Embellishments that I used include Petaloo flowers, Magnolia flowers, a paper lace doily from Wilton, Martha Stewart border punch, Hero Arts lace, Maya Road stick pins, and a special sentiment from the Friends Collection by C.C. Designs. Valerie Salmon has created a another wonderful sketch and as a bonus she has even made 2 more bonus sketches by rotating and flipping it. Check out the sketch here at the Got Sketch Blog. Here is the layout that I made for her using this week's sketch. For the giveaways for yesterday and today, please just leave a comment telling me about your favorite Christmas sweet. I've had a serious sweet tooth lately and want to know if I am missing out on anything. Yeah, today is Simon Says Stamp Challenge blog day. The challenge is to use blue, white and silver on your card. The design team also used a Penny Black stamp so if you have one then please join us with that as well. If you enter your card for the challenge here, you could win a gift certificate to the Simon Says Stamp Online store. For the month of the December the gift certificate prize has been raised to $50. Wow, that is a lot of product. They will also pay the shipping charges. So get your card making supplies out and get creating! The Penny Black stamp that I used is called FROSTY. Simple and sweet, I love it!! It was actually really easy to color too. I just swiped my Copic markers B000, B00, B01 on the sides of the snowman and under the snow and it looks great. I cut out the image with my circle Spellbinders die and mounted it on a scalloped circle Spellbinders die that matched my circle cut out of silver paper. I also used my sewing machine to add some stitching around the edges of the circle die cut and base of the card. For the background snow, I adhered pieces of white grosgrain ribbon onto white cardstock and the cut it into a snowdrift before attached it to the base card. Then I put some Stickles silver glitter glue along the edge. The sentiment tag was first cut with my EK Success large slim line tag punch and then was stamped in VersaMark Dazzle and embossed with Ranger Silver Embossing Powder. Then I used my Sakura Quickie Glue Pen, ****LOVE THIS ADHESIVE/TOOL!!! ****, and drew a line around the edge of the and sprinkled Martha Stewart silver glitter on it. The last embellishment that I created was the snowflake. I used my EK Success Large Snowflake punch on white cardstock and then glued Martha Steward silver glitter to the piece using the Essential Glue Pad by Tsukineko. Then I topped it with another snowflake punched with a smaller Martha Stewart snowflake punch and attached a gem to the center. Today's clue: Stamp, Sprinkle, Heat makes for a special and sophisticated image. Just leave a comment with your guess and you will be entered to win this giveaway. Remember you don't need to be right to win, you just need to guess. Stop by the rest of the girls blog for more fun giveaways. Okay, I knew that this was going to happen. Blogging straight for 12 days in a row is not usually how I roll. So today's post is going to be for day 3 & 4 and I will be giving away 2 of the same things. Clue: Sparkly or smooth, colored or clear, these fun little things add that little extra to any layout or card. Don't forget to stop by the other blogs for more great giveaways! I want to share with you a card that I created for the December Card Kit for Scrapbook Mania. This was a special kit which included two Magnolia images. For the card, I masked the two images together and then colored them. These two stamps put together made a very LARGE focal image so I made this into an easel card so that I add some embellishments to the bottom. There may be a couple of these kits left. If you are interested call Scrapbook Mania at 205-424-4246. Oh my goodness. As I write this post, it is snowing in Birmingham, Alabama. It's just flurries but so very pretty all the same. I hope that it gets a little heavier later in the day. Thanks so much to everyone who has stopped by and left your comments and guesses. It's been fun to read them. So today is Day 4 and I've got another giveaway to announce. But before I do that let me do some mild enabling. The Hero Arts Catalog has been revealed and Simon Says Stamps has the new stamps in and are ready to be shipped to your home. These cute little pennants will be so cute on layouts and cards. I can't wait to get these in my hot little hands. Definition stamps have always been a favorite of mine but I love the smaller size of this set. It's easy to make your own book page paper with these large definition background stamp. The last three stamps are bird themed. I just love the artwork on the following three stamps. These are going to be a great addition to my collection. Okay, enough enabling. I'll get straight to the clues for todays giveaways. Clue for Day Four: Today's giveaway is a little package full of little things to make something little. If you know my style you might know that these are things that I love, love, love to make. Let's see if that is enough of a clue to start with. Remember you don't have to get it right to win, you just have to comment. Don't forget to stop by my friends blogs as well. Lots of wonderful giveaways today. Have a wonderful day. Welcome to a new Simon Says Stamp Challenge blog day!! I had a fantastic time creating this card just for the Simon Says Stamp Challenge blog. Each week the team issues a new challenge and a new winner is randomly picked to receive a $25 gift certificate to the Simon Says Stamp online store. The challenge this week was to follow a recipe. Here is what you need to include on your card. One, image, two pieces of patterned paper, and three embellishments. For this challenge I created a shaker card. I just got this wonderful stamp set from Hero Arts called Sending Holiday Cheer. I stamped and colored the image and then using my Nestabilities circle set, the largest die, I cut it out. To make the shaker part of the card, I took my largest Nestabilities scalloped circle die and cut it out of red cardstock. Then I put the second to smallest Nestabilities plain circle on it getting it even as best as I could and cut that out. That left me with a "window" in my scalloped circle. On the back of this I attached a piece of transparency. The next thing was to place Glue Dot pop up dots around the edge of the back of the scalloped circle. This will create the space that is needed to let the glitter float around the shaker part. Then I scooped up some chunky white glitter and sprinkled it on my image. I took the red scalloped circle and place it on top of my image making sure to center it and press down on the pop dots so that there were no gaps where the glitter could fall out. Then I put together my card pieces. I used The Girls Paperie Tinsel and Twig patterned paper line. I think that this is probably my most favorite Christmas paper line this year. The patterns are adorable and it's just enough distressed to give it some character. I also used the sticker book from this line as well for the sentiment. The last supply I want to point out is the little black dots that I put on my scallops. This is a new product from Ranger that I am flipping over!! Move over Liquid Pearls, mama has a new "favorite" in town. Right now I believe it only comes in black and white but I sure hope that they decide to add more colors. It is called Enamel Accents Black White Opaque Dimensional Glaze. It's hard to believe that those aren't really black pearls isn't it. They are so perfectly round. But they are not. It is an enamel substance that I squeezed out of a bottle. I was amazed at how easy it was to create those perfect little drops. I hadn't been very successful with Liquid Pearls, but I can tell you without a doubt that this product is easy to use and create perfect little domes of color just by squeezing the bottle. Thanks so much for stopping by and I hope to see your card linked up on the Simon Says Challenge Blog. I wanted to announce the winner of my Nikki Sivils blog post. I really loved reading all of your fun Halloween stories. Thanks so much for sharing your story. Tiffany please email me your address at christineousley@mac.com and I will get your prize out to you. I also want to tell you about a new card kit that I have created for Scrapbook Mania. It's will be released tomorrow. If you like what you see and would like to get on the list for next month's kit please email me. Today is my day on the Nikki Sivils blog for September. On her blog I show my little mini album that I am calling BooVille. I made the mini book from the house chipboard book and her Halloween paper line, called Boo-tiful. Click here to get the story behind this mini book, look at the inside pages as well as information on how you could win a little Nikki Sivils prize. I also wanted to post a card that I made with Blueberry HIll. I love the bright colors of this paper line. It makes the best cards to say thank you or hi to a special friend. Thanks for stopping by and don't forget to stop by Nikki's blog to learn how to leave your comment. I really love making cards. I never used to. I was a die hard scrapper and that's all that was important to me. Then I attended my first Stampin Up! party. The hostess made such cute little cards and gifts so fast and easily. Yeah, I got hooked. So I started creating cards with stamps, and then I heard of Paper Crafts Magazine. Well the end result is easy to guess. I am happy to say that I am a Paper Crafter. That sorts of says it all right? So today I would like to show you the cards that I created with paper and embellishments by Nikki Sivils. I am actually only going to show you one because I want you to hop over to her blog and read the challenge that I have given and see the other two cards I made. The challenge is a fun and easy one and there is a prize to be won. Yeah! So go over there and check out the challenge and then pop back here to show me what you have created. Deadline for contest entry is July 12, 2010 at 8:00p.m. EST.